Powers/Abilities: John Cheever possesses no known superhuman abilities. An experienced television reporter and host, he worked for both British and American news outlets. Cheever wears glasses. (Iron Fist I#4) - Assigned to the BBC London, John Cheever was on call when a fight between Iron Fist (Daniel Rand) and the supervillain Radion devastated London's General Post Office tower. Cheever was on the air when massive explosions rocked the building, though he stayed at his post to cover the outcome of the confrontation. (Uncanny X-Men I#113) - In Australia for the BBC, Cheever was on hand to cover Magneto's raids on numerous research complexes in Australia and New Zealand. Arriving at Woombera's Royal Australian Aerospace research facility after the fact, Cheever recounted the events: Magneto invaded the base, defeated the soldiers and absconded with unrevealed equipment, leaving the base itself a burning wreck. As the fires raged, Cheever dramatically remarked that there seemed to be no superheroes left to deal with this menace. The Fantastic Four and the Champions had disbanded, the American government had the Avengers under virtual house arrest and the X-Men "seemed to have vanished off the face of the Earth" (in reality, they were already captured by Magneto). 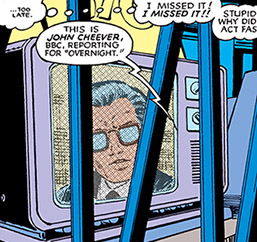 (Uncanny X-Men I#158) - Working for the British news program Panorama, Cheever hosted a report on the rise of mutants in the United States. Focusing on the recent fight between the X-Men and the Brotherhood of Evil Mutants in Washington D.C as well as a recent confrontation with Deathbird in New York, he interviewed Senator Robert Kelly, who was chairman of an ad hoc congressional committee on mutant affairs. 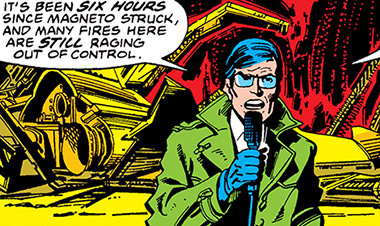 Kelly quickly denounced Cheever's claim the X-Men acted as heroes, since these "heroes" had destroyed a 200 million dollar New York skyscraper. Cheever balked at Kelly's claims the X-Men were outlaws, after all they saved him when the Brotherhood attacked Washington. But the senator defended his beliefs, feeling that the mutant problem was still a great unknown that warranted further and close scrutiny. Cheever pressed on, noting that Kelly's stance on mutants seemed odd considering he presented himself as an avowed civil libertarian. In response, Kelly simply declared that mutants were among those extraordinary cases that transcended morality. On live television, he declared them a possible global threat that needed to be dealt with. 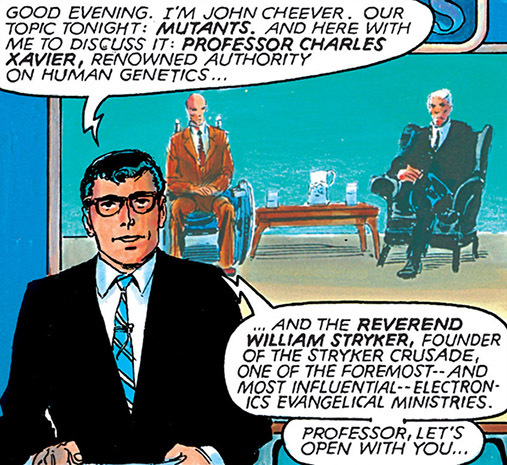 (Marvel Graphic Novel I#5) - John Cheever accepted an assignment for ABC News, agreeing to host a live Nightline debate on mutants which pitted noted genetics authority Charles Xavier versus the mutant hating, yet telegenic televangelist William Stryker. Cheever sat by as Kelly berated Xavier's claims that "mutants" are not a monolithic group by quoting from Robert Kelly's ad hoc mutant activities committee which claimed that "the ever-increasing number of mutants poses a clear and present danger, both to the United States and the socio-political order of the world". Cheever continued to host the hour long debate, which concluded without incident. Off the air, Cheever thanked Xavier for his participation in the discussion, apologizing for having to had to cut it short. (Uncanny X-Men I#184 - BTS) - Newly arrived on Earth-616, the battered and haunted Rachel Summers of Earth-811 happened to watch Cheever's Overnight report on the X-Men's recent fight in Japan against an enigmatic, giant dragon creature. Fair's fair, when Chris Claremont comes up with a character, chances are he or she will be around as long as Chris has a book. Cheever served as an exposition device, always ready to deliver some much needed backstory or to hurry the plot along. Long before the likes of Manoli Wetherell or Trish Tilby showed up on the scene, there was Mr. Cheever. Given Claremont's love for the giants of modern literature, it seems almost like too big a coincidence that "John Cheever" wasn't an homage to the American author of the same name.